Last night we were surprised by an ugly horde of zeds. While we are used to a certain amount of undead visitor traffic, this was four to five times the normal amount. Thanks to Mr. K’s daily weaponry drills, we came out of the situation much better than we would have fared a couple of years ago. We only sustained one casualty: Mr. Anderson was bit and disposed of by our “no fuss no muss” method. 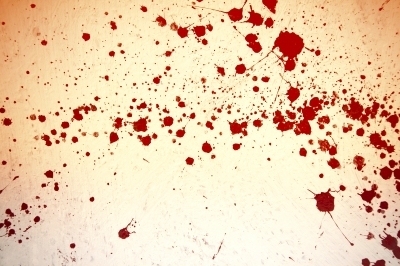 Blood spatter stains are such a chore to clean! Nonetheless Mr. K has called all of the menfolk into a conference that I suspect will last well into tomorrow. The purpose of this meeting is to determine how we were caught unprepared and what measures to put in place to strengthen our defenses. Of course that leaves us females to pick up the mess of the aftermath. I’m not talking about trauma or grief (the children do need a bit of that but given my parenting philosophy I try to leave this sort of thing to people who care). I’m talking about blood stained laundry from some close range kills. Why some people still prefer to use bludgeoning instruments when they have other less messy options, I’ll never understand. I suppose feeling the crunch of skull must be more satisfying than being considerate to your laundress. I seem always to get stuck with these unpleasant tasks. Salt and Water – Let the garment soak in cold salt water overnight. Wash the next morning. Vinegar – Apply the vinegar directly to the stain and blot. When the stain is removed, blot again with a damp cloth to remove the smell. Wash as usual. Baking soda – Mix one part baking soda with two parts water and blot the stain until it lifts. Blot again. Wash as usual. Windex cleaner – Spray glass and window cleaner directly onto the stain and let sit. Blot after 20 minutes. Wash as usual. Club soda – In the unlikely event you get your hands on some club soda during your raids, pour it directly onto the stain. Let it fizz and blot until it disappears. Wash as usual. Do not have any of these supplies? Try your own saliva. It is a little bit gross, but seems to work like a charm. Remember: always wash with cold water! Warm water makes blood stains set. And be sure to blot a stain rather than rub the stain in further. In some cases, you won’t be able to get the pesky blood stain to lift no matter what you do. However, wild blueberries or an extra beet can be used to make a very effective red dye. Dyed to match, indeed!